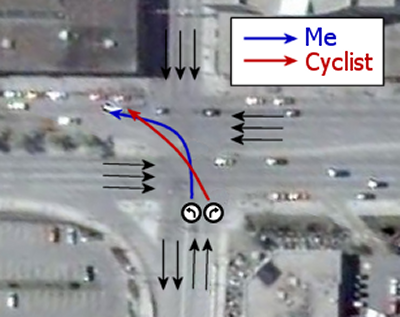 I don’t know why so many cyclists have to be so stupid when it comes to cycling on the streets. I almost hit this clown as he made an illegal left turn across my lane. I almost wish it were legal to hit cyclists who think they can just ride their bikes on the street in any haphazard manner. November Fourth: US Election Day. It’s been almost two years of having the inane politics of America’s pseudo-democracy shoved down our throats every day, and the end is finally in sight. We all know McCain or [more likely] Obama will win, and we all know that will mean four more years of more of the same. To be honest, I actually thought the Republicans were going to take another turn at the White House, and I remained convinced of that until McCain took up Sarah Palin as his running mate. As soon as she started talking I knew the Republicans were going to sit this one out and let their teammates — the Democrats — run things for a bit. I guess after eight years of having the worst America president in history the Republican party needed to take a break and take a couple of years off so people could forget about W.
Nestlé ruined Nutchos! And they’re lying to you about it! Nestlé has ruined a once great holiday treat: Nutchos! They replaced the chunks of nuts with rice crisps! Not only that, but Nestlé is trying to deceive customers by failing to depict this change on the box. The box art only shows hazelnuts and chocolates, and the box describes the food as “Crunchy Nut Clusters covered in Nestlé milk chocolate”. How can they get away with this false advertising of their product? Now, granted, there are a few small shards of what appear to be some sort of nut inside the chocolate (they’re easy to miss), but this is in no way the same Nutchos treat of old.